Day 8 of Zespri Kiwi Challenge, I am making a healthy and colourful yogurt Parfait to cure the bloatness over the weekend. 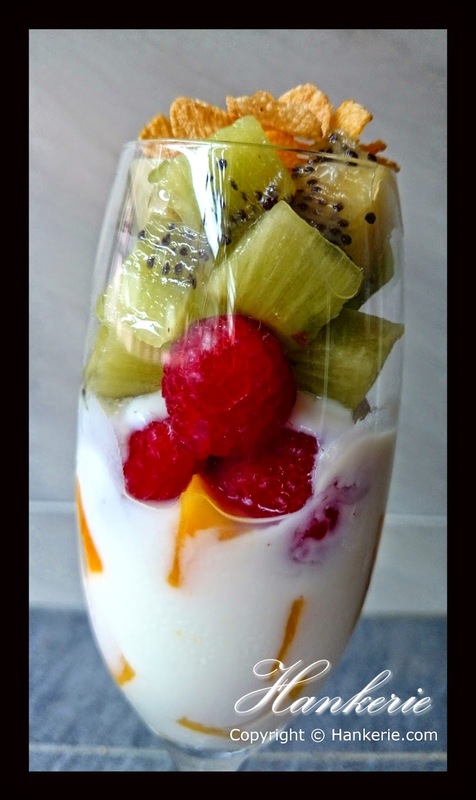 Try this breakfast treat that layers fresh kiwifruits, raspberries, mangoes, creamy yogurt and crunchy corn flakes. In French, Parfait means "Perfect". It is a kind of layered frozen dessert serving in tall glass, and I serve them in my long champagne glass. Kiwis are filled with essential vitamins, too! One medium kiwi packs 5 percent of the daily recommended amount of folate and 117 percent of daily vitamin C. Plus, this tangy fruit provides 38 percent of the recommended daily intake of vitamin K, a nutrient often missing from people’s diets that is essential for bodily functions like normal blood clotting. Well, that's quite surprising. Anyway, this is such a simple parfait to make, and it’s so perfect for breakfast, or even as a snack or dessert after dinner. Now if you don’t find it’s sweet enough for you, you can add some honey over the yogurt. Wash, peel and cut all the fruits into cubes. 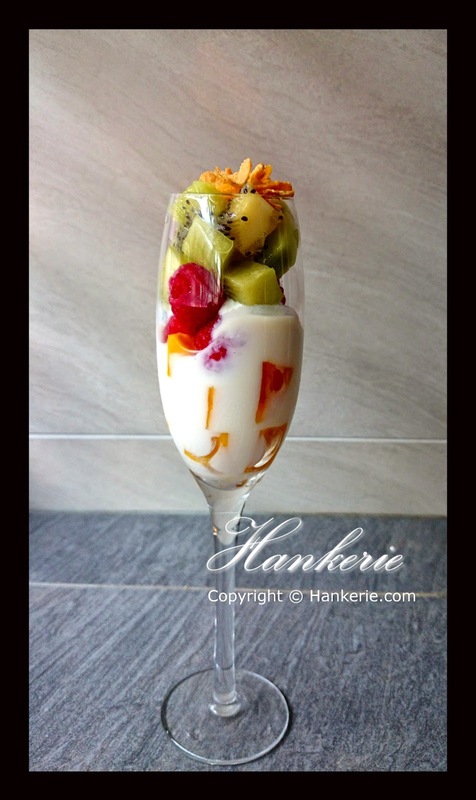 Prepare champagne glass, layer mango cubes at eh bottom, follow by 4 TBSP yogurt, follow by raspberries, 2 TBSP yogurt, follow by kiwifruits and the remaining yogurt. Top with the crunchy corn flakes. Serve it as desired. For my last year's 14 days kiwi challenges , you may refer to this link "Hankerie's Kiwi project went live & 1st VBlog!!!" . Feeling a bit bloated today after the weekend? 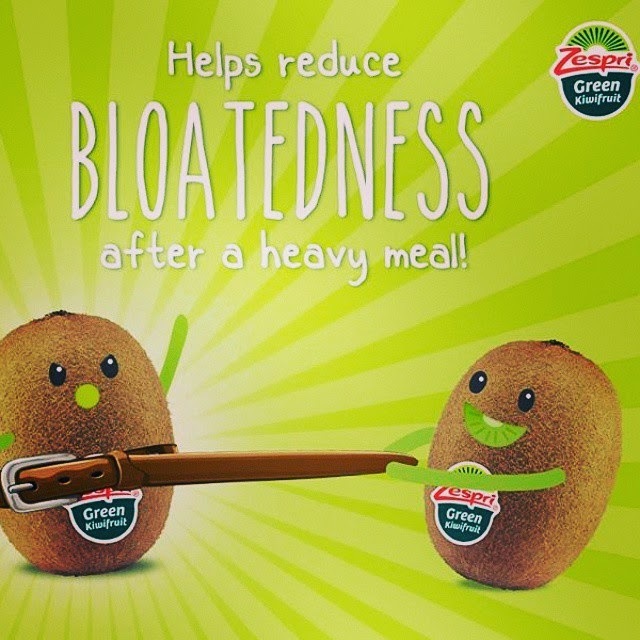 Powered by actinidin and fiber, Zespri Green Kiwifruit can help facilitate gastric digestion and bowel discomfort. Now,you know what to get when your tummy hurts.